Take a shot if you have to hire a lawyer to fight over trademarks. Hasbro, the owners of Monopoly, has opposed a drinking board game’s attempt to register its name, DRINKOPOLY, as a trademark. 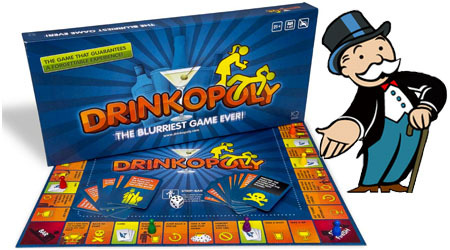 According to its website, Drinkopoly is a “social board game created with the single-minded aim of providing fun & interaction between people.” In other words, get drunk, play board games, do inappropriate things, and get more drunk. You can see some of the sample cards to the right. Being that it’s a board game and being that it is clearly a play off of the MONOPOLY trademark, its surprising to see that Hasbro has not taken action against the game before. Drinkopoly has been around since at least 2010, but only last year did it try to file a United States trademark registration application. Hasbro wants the mark to go to jail, directly to jail. Since 1935, people have been playing Monopoly. Using the name of streets in Atlantic City, the board game is an institution. Hasbro now owns the rights to the game and the many trademarks associated with it including one for the actual look of the Monopoly board. Drinkopoly is just a play on its name and Hasbro argues that consumers would confuse the drinking game with its game when there is no relationship between the two trademarks. But what about fair use, satire, parody and all that stuff lawyer guy? While parody is a defense to claims of infringement, it cannot be used a justification to have a trademark registration granted. This is most likely why Hasbro has not taken legal action against Drinkopoly in the past but has only opposed the registration of its trademark. Hasbro aint playing around and it is very protective of the mark, let’s see if Drinkopoly is going to grab a thimble and join in this game of trademark registrationopoly or just cash out.